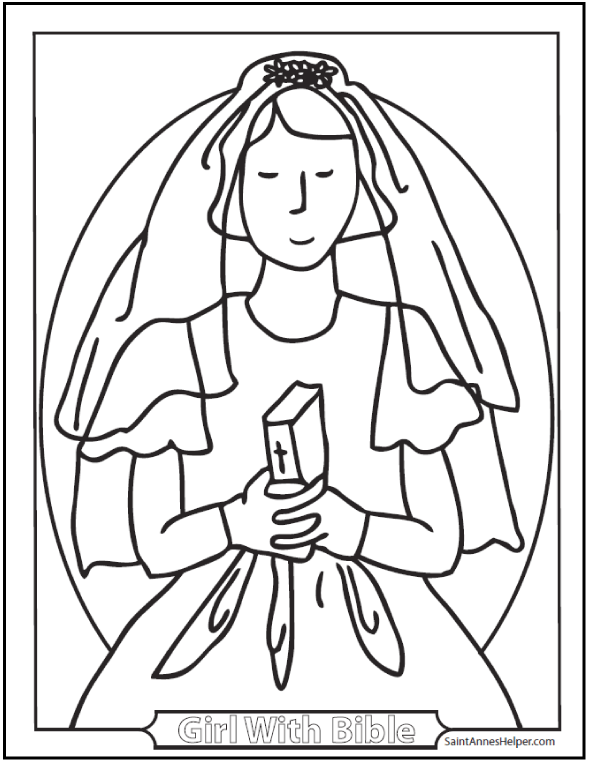 This coloring page shows a girl saying her prayers before Communion. Maybe this is a modest wedding? It could be a girl with a Bible. This PDF prints 8.5x11" single sided. We can think of Jesus, Mary, and Joseph when we say our prayers before Communion. It is so nice to have short prayers memorized that we can pray before receiving Holy Communion. Remember to say the Act of Contrition at some point and then ask Jesus, Mary, and Joseph to help you. 1. Mary my Mother, help me to prepare my soul for the coming of Jesus. 2. Jesus, I believe that thou art truly present in the Host, and very soon, Thou shalt be truly present in my heart. 3. I am sorry for all my sins because I love thee and have saddened Thee. I will try not to sin again. 4. I love thee, Jesus; I love Thee with all my heart! I love Thee above all things, and I would like to love Thee more! 5. Come, my Jesus, come to me! My heart is longing for Thee! 6. Mary, my Mother, welcome Jesus into my heart! The Acts of Faith, Hope, and Charity are beautiful to pray before Communion.